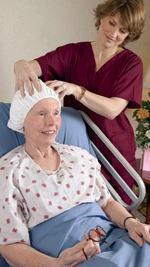 The Easy Shampoo Basin is an inflatable basin that allows confined persons to enjoy a refreshing in-bed shampoo. Comfortable and convenient. The original inflatable shampoo basin. Made of heavy-duty vinyl and inflates to 24 in wide x 20 in long x 8 in deep. Features inflatable headarest for added comfort and included drain hose and stopper.